CITY HALL — Businesses affected by Second Avenue subway construction were hoping for a light at the end of the tunnel, but the MTA was unwilling to budge on a request Monday to reimburse them for lost revenue. Small business owners affected by the first phase of construction on Second Avenue between East 63rd and East 96th streets blamed declining earnings on the ongoing project at a City Council hearing Monday, and demanded compensation. Aside from declining foot traffic due to the loss of sidewalk space, Pecora testified that Second Avenue Subway construction has resulted in other disruptions in business, including sporadic loss of electrical power, delayed deliveries due to unannounced street closures and spotty trash pick-up. But while representatives from the MTA showed sympathy and regret that businesses along Second Avenue have to contend with decreased foot traffic, they were adamant that they could not be held responsible for lost revenues. Horodniceanu cited other potential factors for the closure of businesses, including the economic downturn and natural cycles of business. He added that since launching construction, the MTA has posted signs letting pedestrians know about the businesses on the street and has conducted site reviews for cleanliness. A full-time public outreach coordinator tasked with responding to the complaints of business owners along the construction route has also been designated. But community advocates were unimpressed despite the MTA’s seeming efforts. Jared Stone, 28, a Columbia MBA student who lives at East 81st Street and Second Avenue, said that he plans on launching a Web site that will help neighborhood businesses. 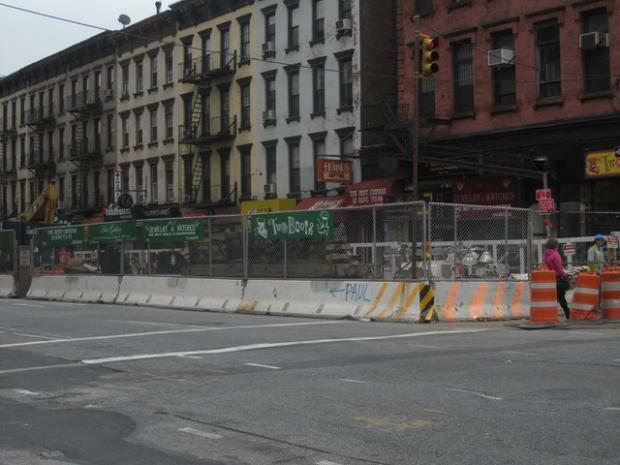 The site, Second Avenue Shopper, will highlight shopping deals at the businesses affected by the construction. “The MTA has spent all this money and this website cost $154 and I’ll bet it’ll do more good,” he said.